There weren’t enough jobs in India when the economy was growing at a world-beating annual rate of 8% in financial year 2015. So, the latest official estimate of GDP growth should be a wake-up call for the Narendra Modi government, lest India’s famed “demographic dividend” is turned on its head. On Jan. 05, India’s chief statistician (CSO) projected that Asia’s third-largest economy will grow by 6.5% in the current financial year—the lowest rate of expansion in four years. And having millions of young people unemployed, no matter what the growth rate, is a ticking time bomb. Agriculture, which makes for 17.3% of the country’s GDP, offers livelihoods to over half the country’s population. It is expected to grow at an abysmal 2.1% in financial year 2018, according to CSO estimates. That’s less than half the growth rate a year earlier. Overall the economy may be growing at a faster clip than many other countries, but it dodges this half of its population year after year. If India wants fewer people to depend on agriculture, it needs to create non-farm jobs. But even when India was growing at over 7% between 2013 and 2015, the rise in non-farm jobs was only 1.3% annually, according to a June 2017 McKinsey report. With agriculture struggling, government after government in India has over the years promised factory jobs but private investors, who are expected to create most of these jobs, have not played ball. Demonetisation and the goods and services tax (GST) further dented the willingness of the penny-wise promoters. Corporate investments in new projects slid to a 13-year low in the October-December quarter of financial year 2018. Growth in manufacturing is expected to slow down to 4.6% in the current financial year, compared to 7.9% a year ago. Meanwhile, over 400 million Indians work (pdf) in the exports sector, which boomed alongside other emerging markets at the turn of the century. But over the last five years, exports’ contribution to India’s GDP has nearly halved to less than 20%. 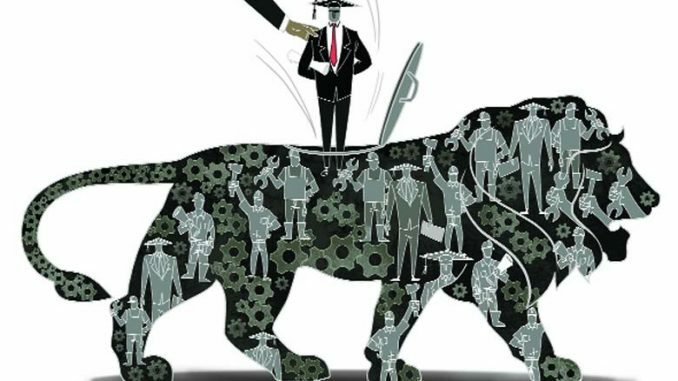 Even as global trade improved, India failed to capitalise on it. Exports grew 12% between April and November 2017, slower than Vietnam’s 24% and Indonesia’s 16% year-on-year, the Mint newspaper reported. Within exports, the biggest employers such as textiles, electronic goods, gems & jewellery, leather, and agricultural products continue to struggle. Meanwhile, 17 million people are entering the workforce every year, but only 5.5 million jobs are being created. With 65% of Indians aged less than 35, the country can ill-afford a jobs crisis. With social fault lines deepening—around religion and caste—unemployed youth could only find more ready reasons to use violence to vent their frustration. The inter-caste strife that stalled the country’s financial capital Mumbai for a day on Jan. 03 was a case in point, drawing comment from even India’s usually tightlipped business leaders. India’s annual economic growth of 6.5% may still be the world’s envy, but it’s hardly the time for complacency.